Every spring I look forward to the time when our tree blooms in the back yard by the pond. The flowers are the softest pink and smell so good. The tree is right outside my bedroom window and yesterday when I woke up I realized it had started to bloom, so I rushed home yesterday after work to snap some pictures. I had a little trouble with my picture taking skills though. Sometimes I wish I had someone who followed me around and took photos for me like some bloggers do. Do you find it difficult sometimes to get the photo you want just by using the timer/remote and tripod? I love this dress so much that I wore this twice in one week! GASP!! I wore it to church on Easter Sunday and then to work just yesterday. The dress is so comfortable and a such great score off of Hautelook.com. I love these Coach shoes so much but sadly they are too big. I have always been a size 8-8 1/2 for years! But lately I've been wearing 7 1/2-8. I guess your feet shrink as you get older? I can't return the shoes since I've worn about three times and had the bottom of the soles protected by my cobbler. (Notice the brown tread sole in the picture?) So I guess I"m going to either have to sell them via my shop or just wear and fall out of them. The bow in the back is such a cute detail and it tightens the upper leather to fit snugger. Unfortunately they are still too big when I do this. Decisions..decisions. Maggie wanted in the picture to give me a kiss! How cute (but dirty) is she! Love this dog! PS- Right now I am so lusting over these Miu Miu Sparrow Printed Mary Jane Pumps but can't find them anywhere online! Do you know where I can find them?? Also, do they run TTS, Small, or Big? I really want these and any help I will be forever grateful for! :) Thanks! LOVE the use of color and proportions (and the flowers :-)). The shoes balance the rest of the outfit perfectly. Beautiful spring outfit. those shoes are so gorgeous! It's to bad they're a tad too big.... damn my child sized feet or i would totally take them off your hands! 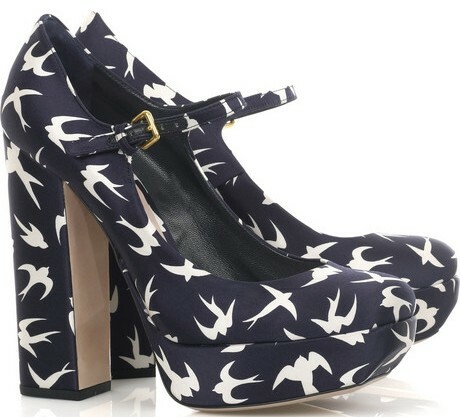 Oh my goodness I am in lust over your wedges!!! Those wedges are gorgeous.. Im looking for a pair similar to those!